PURDY, Eileen Arabelle (Church) – Age 96, passed away peacefully in the Lakeshore General Hospital, Kirkland, Quebec, on January 21, 2014, following a brief illness. 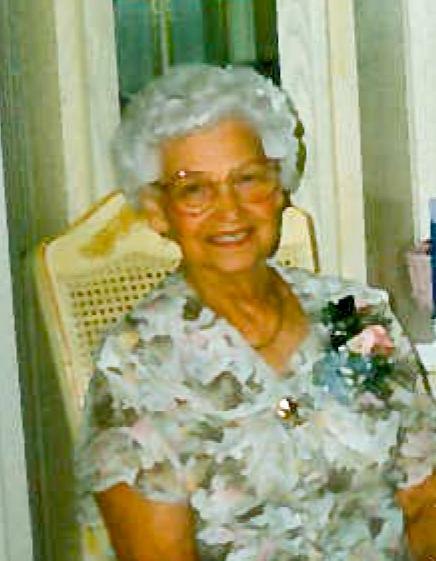 She was born on March 6, 1917, the eldest child of the late Dexter and Arabelle (Wallace) Church of Belmont, Hants Co. N.S. She grew up on the family farm, attending the one-room schoolhouse for her junior matriculation and completing high school by correspondence courses, passing the N.S. Provincial exams. She married H. Oscar Purdy of Windsor, N.S. in August, 1938 and they spent the first year of married life in Truro, N.S. where he attended Teachers College. They subsequently lived in Ellershouse, Windsor and Wolfville before moving to Montreal in 1952 when he accepted a teaching position with McGill University. She was a very supportive teacher’s wife and active in the women’s groups of the United Church wherever they lived and sang in the choir. She was creative, musical and artistic and especially enjoyed china painting, producing many beautiful pieces. She is survived by sons, Winston Purdy and David Purdy, Montreal, John Purdy, Kirkland, Que; grandsons, David Jr., Matthew, Christopher and Shaun; granddaughter Allison (Murray) Figg, Australia, and great-granddaughter Lola; sisters, Shirley Ermel, Hanover, Ont., Elizabeth Taplin, Newmarket, Ont. and Diana Bishop, Kentville, N.S. ; sister-in-law Shirley Church, Dartmouth, N.S. ; many nieces and nephews. She was predeceased by her husband of 65 years, H. Oscar Purdy, daughter-in-law Kathleen Purdy, and brothers, Gilbert Church, Windsor, N.S. and Elliott Church, Poplar Grove, N.S. A memorial service and celebration of her life was held on Saturday, February 1, 2014, in Beaurepaire United Church, Beaconsfield, Quebec.